"May your days be merry and bright..." Celebrate the season with this lovely GIFTABLES Pearl Rectangular Engraved Tray from Beatriz Ball. 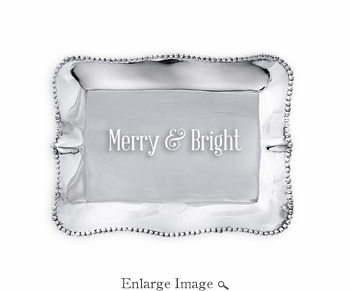 Engraved with the slogan, "Merry and Bright," this delightful mini tray is distinguished by its rich, hand finished surface, and practical size. Great for the Holidays! Perfect on the bar or dining table, or on a desk, bedside table, or coffee table as a decorative accent. From our GIFTABLES Collection featuring handmade and artfully designed Beatriz Ball items at irresistible prices. Packaged in a lovely gift box, makes lovely present for the Holidays, birthdays, anniversaries, and other occasions. Handmade of an FDA safe, easy-care, oven and freezer friendly aluminum alloy. Tarnish free.